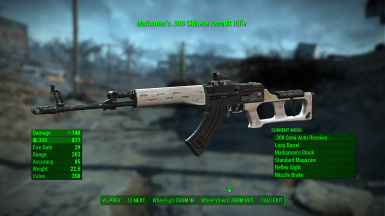 Total rebuild of the classic Fallout 3 Chinese Assault Rifle for Fallout 4, complete with new meshes, textures, and full crafting, mods, and levelled list support. Bakelite Magazine For Wasteland Melody's Chinese Assault Rifle MUST be installed first. Please contact me first if you would like to use any of my assets in another project or mod. Thanks! Wasteland Melody (me!) - meshes, textures, CK work, etc. - Small and extended magazines. Small - medium - large capacities are now 10, 24, and 36, respectively. - Suppressor! Standalone suppressor that can be used with any of the barrels with a muzzle slot. - Completely rebalanced levelled lists to make the gun more rare. Only elite raiders and gunners will spawn with it now until much later levels. 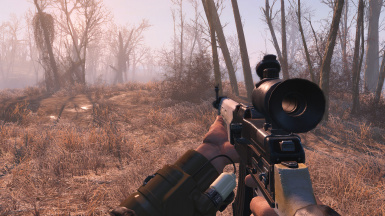 Unfortunately, this requires completely uninstalling the mod, saving, and re-loading the mod again, which will wipe out any existing copies you have of the rifle. - Major rebalance of the required crafting levels and components. Component usage better reflects the vanilla game, and the required perks have been generally increased to better reflect the gun being higher-tier. - Minor handling rebalance. Significantly increased recoil in semi-auto to keep the "stiff but strong" gunplay that auto has. It's not a precise weapon, but it is powerful. - Damage rebalance. Increased the damage ever-so-slightly to give it more of an edge over the combat rifle at higher levels. This was it's more of a tactical choice at long range- go with better accuracy or more damage. At short range the CAR will still generally trump all the vanilla ballistic rifles, where accuracy isn't important but raw damage is. This was a bit more of an opinionated edit, but I'm hoping the gun handles a bit more how I wanted now, and its boosted damage is balanced out by stiffer recoil. Restricting the mods and making it more rare also lends to it being a more 'elite' and coveted weapon. - Fixed mod spawns so that higher-tier mods don't spawn on enemy weapons until later levels. Removed hard edits to levelled lists in favour of a scripted soft edit. Added new receivers in more calibers. Added the Long Barrel, Suppressed Barrel, and Scout Scope mods. Added a new location with a unique Legendary called "The Regulator"
Initial upload, fixed missing .esm! Boy, that wouldn't be very fun at all. 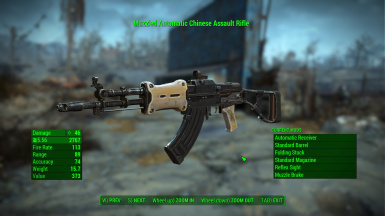 Miss the classic FO3 Chinese Assault Rifle? Well, so did I! 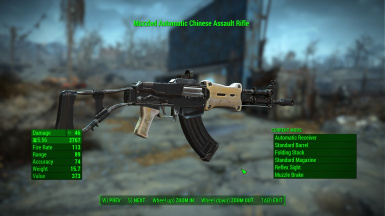 A re-imagining of the classic Fallout 3 weapon, the Chinese Assault Rifle has been lovingly rebuilt for Fallout 4, with dozens of new meshes and textures all made from scratch. 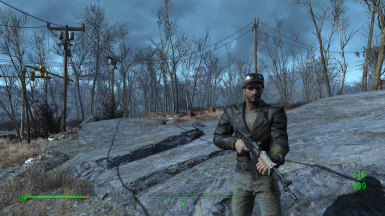 The rifle comes complete with a variety of mods, including multiple stocks, barrels, scopes, and magazines to choose from, all inspired by real-world com-bloc weapons and redesigned for the Fallout universe. This mod also adds the weapon to the appropriate leveled lists via script, meaning it will not conflict with mods which edit the same lists. 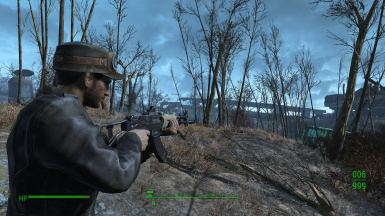 The weapon can be found in the hands of raiders and Gunners, at stores and travelling merchants, and at a number of unique locations hidden across the Commonwealth. A: From the corpses of your enemies! (It will spawn on Raiders, Gunners, and a few other places like stores). Q: What if I want it right now? A: You can console-command it to yourself. Type "help chinese 0" to find the item code for it. It'll be at the bottom under WEAP for "weapon." Q: My gun is invisible/purple! What's wrong? A: The game can't find the mesh/textures. The mod probably had an installation issue. Check your settings and re-install. Q: Why is the reloading animation weird? A: As of now it is effectively impossible to add new animations, so we're stuck using what's there. Until someone makes 3rd-party tools to add animations to the game, nobody can add them. Q: Will this conflict with other weapon mods that update levelled lists? A: Nope! All the lists are updated via script the first time you load a save with the mod. For this reason I recommend placing it after anything that changes levelled lists in your load order. Q: Did you use the mesh hidden in the game files? A: Nope! Not any part of it. I decided to toss it away and start from scratch as both a personal challenge and a way to add some new/different details, as well as support Fallout's left-handed animations (which the original model doesn't). Unzip, copy + paste to Data folder. Or use NMM. If you find any bugs/issues, or think the gun could use some balance tweaks, please let me know! Special thanks to everyone over at r/falloutMods who helped me navigate some of Fallout 4's new challenges, and everyone at Nexus who supported my mod, and I hope you all enjoy! Everything has been balanced to make the Chinese Assault Rifle a higher-tier, more end-game weapon. It will start appearing at level 16, and become fairly common by level 28. There's also unique variants hidden in the world! Following its real-world inspiration, the Chinese Assault Rifle has high damage but stiff recoil, requiring a lot of wrangling to keep it on target during sustained fire. The Marksman (semi-auto) variant is fast and powerful, outstripping similar weapons like the Combat Rifle in pure damage output, but boasts significantly less accuracy and handling than its peers, especially at long range. 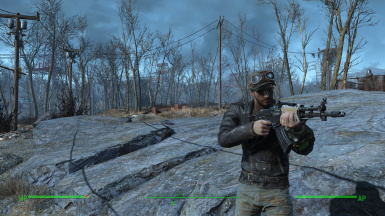 The rifle has been added to the appropriate levelled lists with carefully curated variants appearing for each faction. Raiders can be found with chopped-down short-barrelled versions for run-and-gun ambushes, and Gunners utilise the long-barreled and extended-stock semi-auto version for sniper attacks. The textures are generally all 2k, with the exception of some of the smaller parts.